Imagine an hour…a day….a week without speech. Imagine not being able to say ‘I love you’ this Valentine’s Day. Unfortunately, that is the fate met by most people living with Motor Neurone Disease (MND). Mairéad Coleman is 50 years old from Roundfort in Co. Mayo. She is married to Michael and they have two children Cian and Hannah. In February 2013, Cian sadly passed away from cancer at just 16 years of age. In August 2017, Mairéad was diagnosed with Motor Neurone Disease. Since then, she can no longer work and her speech, swallowing and breathing have been affected. “I was shocked at the diagnosis, but the worst had already happened to my family, the loss of our son Cian. He only had 16 years on this earth while I have had 50 years so far. I didn’t feel sorry for myself but I was heartbroken for my husband Michael and my daughter Hannah. Numerous things were running through my head! How will Michael and Hannah cope with this again? Our small family of four will become two,” said Mairéad. This February we are once again running our Sponsored Silence campaign #Voice4MND. All we ask is that you stay silent for a minimum of 30 minutes so you can experience what it would be like to lose your voice. Imagine one hour, imagine one day, imagine one week without your voice. 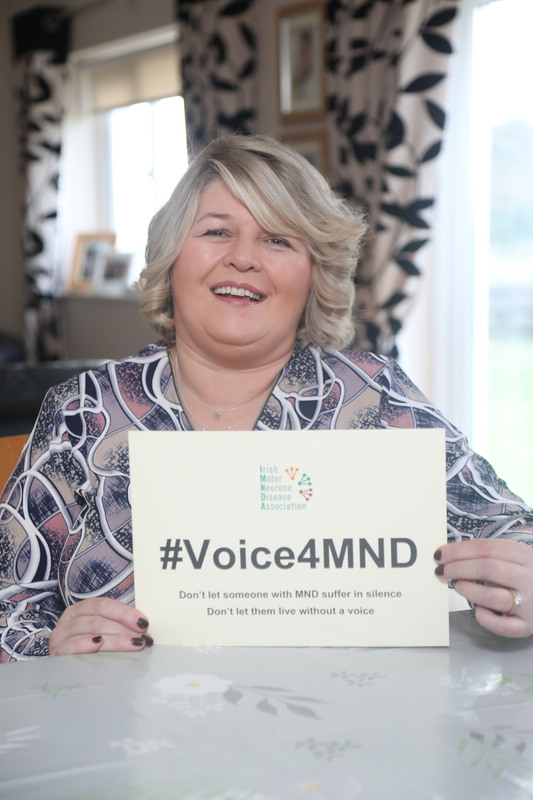 We want you to give up your voice so you can experience what it is like for someone with MND. All you have to do is to pick a day and duration for your silence. Then maybe think if you had no voice for a day how would you communicate – by app, by pen and paper? “There is a huge impact on my life having been diagnosed with MND. The muscles in my mouth including my tongue are very weak and so I need to use machines every day, morning and evening to keep my chest clear. For me all of this takes up a lot of my day when I should be doing other things but it is a necessary evil and these machines help keep me well,” said Mairéad. To get involved in our Sponsored Silence all you have to do is email fundraising@imnda.ie and we will send you out your Silence Pack. Spread awareness by sharing your sponsored silence on social media by using #Voice4MND. Nominate friends and families to join you – get your school or work colleagues to take part. “I am very positive when it comes to my illness and embrace the changes it has made to my life. Don’t get me wrong, sometimes I have meltdowns like everyone else but for the most part, I’m enjoying my family, my friends, my life – so bring it on! I’ll keep fighting until I can’t fight anymore,” said Mairead. You can also donate to the campaign by texting MND to 50300 to donate €2 (100% of text goes to IMNDA across most network providers. Some providers apply VAT which means a minimum of €1.63 will go to IMNDA. Service Provider: LIKECHARITY. Helpline 076 6805278). Sometimes silence can speak volumes. Take on our challenge this February. Don’t let Mairéad suffer in silence; don’t let her live without a voice. Lose your voice so that others can be heard.